Alfred’s been kidnapped. Again. He’s being held for ransom for Bruce Wayne to pay. Again. With the rest of the Batfamily busy Batman is alone to save him. Not to worry though. Alfred can save himself. He’s done it before. That’s why this is one of my favorite issues. 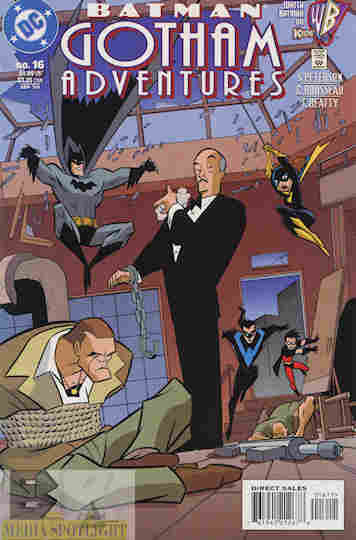 It’s fun watching how Alfred handles the situation, from protecting the other staff members who were kidnapped because the goons weren’t very bright (they aren’t even on Bruce’s staff…seeing how his staff is just Alfred) to how he defeats the goons while Nightwing, Robin, and Batgirl have to handle so many waves of thugs you’d think they were in a video game. It’s just a fun read, and I like seeing that a Batman story can be fun. Nothing wrong with this comic and it’s one you should really check out. Posted by ShadowWing Tronix on July 21, 2018 in Animation Spotlight, DC Spotlight, Television Spotlight, Yesterday's Comics and tagged Alfred, Batman, DC animated universe, DCAU.